264 pages | 83 Color Illus. Future directions for crime analysis. Packed with case studies and including examples of specific problems faced by crime analysts, this book offers the perfect introduction to the analysis and investigation of crime. It is essential reading for students taking courses on crime analysis, crime mapping, crime prevention, and environmental criminology. A companion website offers further resources for students, including flashcards and video and website links. For instructors, it includes chapter-by-chapter PowerPoint slides. "With short, simple chapters that cut to the chase, Walker and Drawve have written a crime analysis book that will be easily accessible to an undergraduate audience." "An insightful and engaging look into the realm of crime analysis that offers readers a practical understanding of the field and its methods, making the crime analysis profession an invaluable resource to public safety agencies and the communities they serve." "The emergence of crime analysis has been a driving force in the modern evolution of policing. Indeed, crime analysts, and the work products they produce, are integral to the design and implementation of evidence-based crime prevention practices. 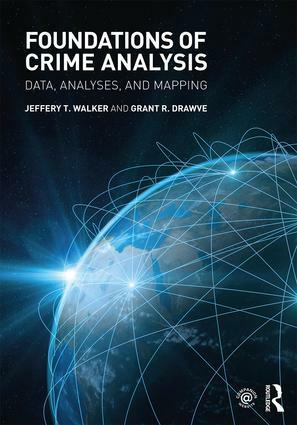 In Foundations of Crime Analysis, Walker and Drawve present a comprehensive overview of crime analysis techniques. The book is greatly beneficial to both academics and practitioners interested in further developing their understanding of crime analysis." "This book covers a variety of topics relevant to the field and is a great resource for students being introduced to the field, new analysts, and even experienced analysts. As an experienced analyst, I really appreciated the chapters on presenting information and picked up some new tips, tricks, and ideas. I have seen so many changes over the last 20 years, many aspects of my job today that I could not have imagined at the beginning, so I enjoyed the last chapter discussing the future of the field, thinking about where we are all headed, and how it can impact not just law enforcement but other aspects of the criminal justice arena as well." Jeffery T. Walker is a Professor and Chair of the Department of Criminal Justice at the University of Alabama, Birmingham, USA. He has written 10 books and almost 100 journal articles and book chapters. He has obtained over $12 million in grants from the Department of Justice, National Institute of Drug Abuse, National Science Foundation, and others. Grant R. Drawve is an Assistant Professor in the Department of Sociology and Criminal Justice at the University of Arkansas, USA. He is a research affiliate of the Center for Social Research (CSR) and Terrorism Research Center (TRC) at UA, Rutgers Center on Public Security (RCPS), and on the executive committee for the National Dialogues on Behavioral Health (NDBH).